NBC Chicago's Zoraida Sambolin and Kye Martin want to take their running shoes to New York and anchor from the "Today Show" plaza in April, but they need your help to get there. Zoraida and Kye will join the "Today Show's" #RunforTODAY team to promote the benefits of women running. Women at NBC stations across the country will join the Today Show's Natalie Morales and Erica Hill in participating in local spring races to raise awareness and encourage fitness. The local anchors with the most running team members get to go to New York to run the MORE/FITNESS/SHAPE Women's Half-Marathon with Natalie and Erica and anchor a morning show from the "Today Show" plaza the next day. Viewers can help Zoraida and Kye get to New York by signing up for their team below, and interacting with them on social media by helping them build an epic running playlist for them when they represent the NBC Chicago morning team in the Bank of America Shamrock Shuffle March 29. Kye Martin wants your help in building a Shamrock Shuffle playlist for her and Zoraida to help them get to New York in April. You can send your suggestions via Twitter using the hashtag #RunforTODAY and tagging @NBCChicago, @StrideNBC, @ZoraidaSambolin or @KyeCommuteNBC. You can also share your suggestions using the hashtag on Facebook. In order to help Zoraida and Kye win, you must use the hashtag #RunforTODAY in your posts. If you don't have a song suggestion, feel free to simply share your own running story or offer words of encouragement to our morning show running team. 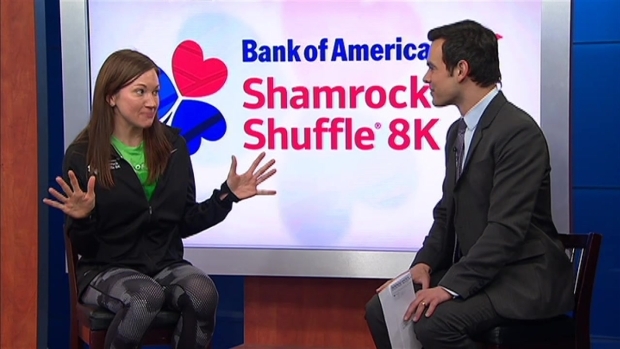 In mid-March, NBC Chicago viewers can sign up for the Shamrock Shuffle through our website and join Zoraida and Kye in the race.